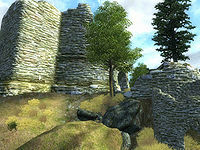 Crowhaven is a fort located along the Gold Coast of Cyrodiil, in County Anvil. During the Second Era, it belonged to the Jarol family and was known as Jarol Estate. It later went on to become the home of the Lord Loviducus, but fell into ruin and became home to a den of feral vampires. 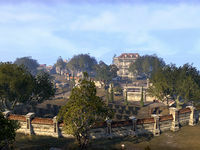 It is located near the ancient Ayleid settlement of Garlas Malatar. In 2E 583, the fort was owned by Lord Quintus Jarol, whose grandfather used the tunnels beneath it to smuggle goods in and out of Anvil. The tunnels connected to the Withered Rose, a small inn south of the estate, and he worked alongside Rose family in his operations. Lord Jarol would later make the same deal with the current Rose family members that his grandfather made, paying them to use the tunnels. Jarol met with Fortunata ap Dugal and Carolus Aquilarios to negotiate with them. Under a contract from the Dark Brotherhood, an initiate infiltrated the estate and assassinated Lord Jarol as part of their assignment. Lord Lovidicus was a nobleman of high birth in the Third Era. He was stricken with vampirism, but kept his secret for two hundred years and continued to pose as a mortal. He fell in love with an Orc servant named Luktuv gro-Malog, whom he miraculously impregnated. When he told Luktuv of his affliction, she betrayed him and locked him in his private quarters, fleeing from Crowhaven to live in the Imperial City. There she gave birth to Agronak gro-Malog, who would go on to become the famed Gray Prince of the Imperial City Arena. In the decades after his imprisonment, the fort fell into ruin and several sections of it apparently collapsed, both above ground and below. A group of feral vampires took up residence in the underground burial halls, and their wolf companions were given free reign of the fort's passages. Undead skeletons also haunted the ruins. In 3E 433, Luktuv gave the key to the Crowhaven private quarters to Agronak, who was unaware of his vampiric lineage. He was eager to prove his birthright, but unable to journey to Crowhaven due to his training. He sent a fellow Arena combatant in his place, who entered the ruined fort and freed Lord Lovidicus. The vampire had been driven insane over the decades by his hunger for blood, and attacked the combatant, who slew him in self defense. The combatant retrieved the lord's journal from the ruins and brought it to Agronak as evidence of his shocking birth. This page was last modified on 14 February 2019, at 19:24.